Everything you need to know about earning your Commercial Driver’s License (CDL). Can’t imagine yourself sitting at a desk in some stuffy cubicle five days a week? Enjoy being out on the road? Would you enjoy it more if you actually get paid to do it? If your answer to these questions was “yes,” then there’s a future for you that could be perfect — as a commercial truck driver. And if that is something that does sound appealing to you, your timing couldn’t be better. Because it’s a career that’s experiencing solid growth both nationwide, and in Pennsylvania. In fact, the U.S. Department of Labor, Bureau of Labor Statistics indicates that between 2016 and 2026, the profession will grow by more than 108,000 across the country. And in Pennsylvania, O*Net online reports that the need for heavy and tractor-trailer truck drivers will grow by 12 percent between 2014 and 2024. Being a commercial truck driver is a serious job that can be quite demanding. It requires a specific set of both physical and mental characteristics in order to succeed. But before you even get to that point, the first step is to get the education and training that’s required. To begin a career as a commercial truck driver, you need to earn your CDL — Commercial Driver’s License. If you’re under the age of 21 and have earned your CDL, the Federal Motor Carrier regulation states that you’re restricted to driving trucks within state borders. If you have your CDL and are 21 or older, you’re able to drive across state borders. 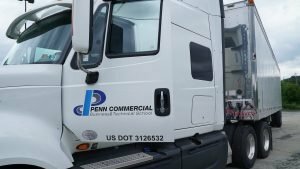 How do you get a CDL in Pennsylvania? Fill out the Commercial Learner’s Permit form and hand in, in person, to a Driver License Center. For more information, see the Instruction Permit section below. Pay the required fee for your permit. If the privileges requested require a Knowledge Test and Road Test, you will be issued a Knowledge Test Authorization, after which you will have to clear the Knowledge Test. Attend and then provide proof that you have taken a commercial driver’s education program specifically for commercial motor vehicles. Take a road test at your local Driver License Center. Pay license and endorsement fees. 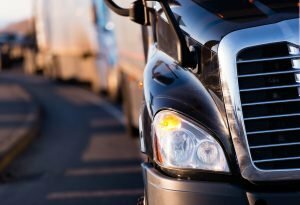 How much does it cost to get a CDL in Pennsylvania? When you’ve passed all the required tests, the standard CDL license cost is $89.50 and is valid for four years. The amount a commercial truck driver makes per year can vary based on a number of factors — how much experience they have being a big one. According to O*Net online, the median annual salary for heavy and tractor-trailer truck drivers in Pennsylvania is $44,800 — that’s $2,000 more than the national average. Do you get paid for CDL training? You may. There are a number of employers who do in fact pay employees for being trained and obtaining their CDL. Other forms of payment are tuition reimbursement programs that employers may also offer. How old do you have to be to earn your CDL? You must be at least 18 years old to earn your CDL, and at that point, you’ll only be able to drive within the state of Pennsylvania. When you turn 21 and still have a valid CDL, you’ll then be able to drive commercial trucks into other states. So if all of this sounds good and you know that earning a CDL is the best move for you, what’s next? You need to start by finding a high-quality education and training program that’s designed to prepare you to get on the road quickly and with the highest level of driving skills possible. That’s just the kind of program you’ll find at Penn Commercial Business/Technical School. Penn Commercial has earned its outstanding reputation throughout the state of Pennsylvania for nearly 90 years, educating and training generations of bright, motivated, skilled professionals in everything from business to health care, to trades. Again, the program can be completed in just six weeks, and upon completion, you’ll be eligible to take the Commonwealth of Pennsylvania Commercial Driver’s License practical and written examinations for Class “A” commercial vehicle with tanker endorsement. If you think a CDL is your best path forward, contact Penn Commercial today to learn more about how we can get you on the road — and getting paid!